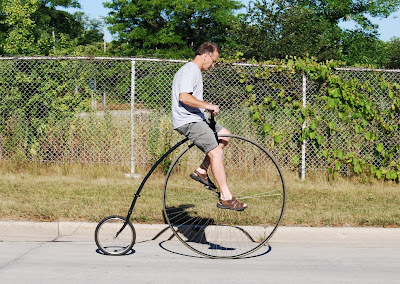 I saw this bicyclist out for a ride a couple weeks ago. It looked like he was concentrating pretty hard on staying upright, so I wasn't about to try to stop him and ask a bunch of questions. If I had the chance, I probably would have asked where you go about getting a replacement tire or innertube when you get a flat... perhaps the front tire is solid? Does anyone know?